There are few things as comforting as pasta. I was getting over a stomach bug last week, and this is all I wanted. 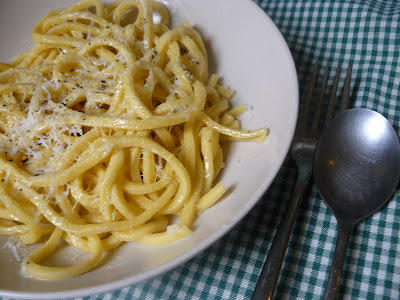 This is my version of a classic Italian dish from Rome, Cacio e Pepe. The traditional dish is pasta (usually spaghetti or bucatini) with pecorino cheese (tastes very similar to parmesaan) and LOTS of black pepper. I'm more of a salt lover, and I think everything tastes better with butter. So if you have a stomach ache, or you want to stay in with some comfort food, knock yourself out with my personal favorite. Spaghetti with Pecorino Cheese Drop spaghetti into boiling salted water. Remove when tender and drain water. Put desired amount of spaghetti into bowl, and stir in 1 tablespoon butter. Grate fresh pecorino cheese on top and salt to taste.